I remember my Granddaddy pulling out his pocketknife and carefully digging up dandelions in the yard. Never mind the pretty yellow blossoms. Dandelions were weeds, and they had to go — root and all. Granddaddy would probably have a really good laugh if he knew that I grub up my dandelions, cook them and eat them. 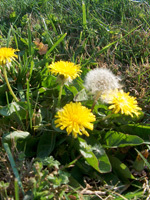 Dandelions are very versatile herbs. You can use the roots for teas that cleanse the liver (and also keep yeast infections at bay), pick the new leaves for salads, or fry up the blossoms for a unique taste treat that will impress your friends. To make Fried Dandelion Flowers, you must first gather your blossoms. You want newly-blossomed dandelions, bright-yellow in color and not the puffy white seed pods that are fun to blow but not good to eat. If you have kids, they love to go collect the little yellow blooms. Just send them out with a bucket and let them pick away. You’ll need between 2 and 3 cups of dandelion blossoms for four side dish servings. Be sure to wash the flowers and clip the stems down to the edge of the flower head. The stems (and older leaves) have a bitter taste, so you don’t want to fry those. Wrap the blooms in paper towels. This will absorb the water that collects in the flower heads. Beat the egg and add the milk. Whisk in the flour and seasonings. You can dip the flowers and fry immediately, but the batter stays on better if it's refrigerated for a half hour or so. When the batter is lightly browned, lift the flowers out of the oil and drain them on paper towels. Fried Dandelion Flowers are good served as appetizers or as a side dish with ham. Optional: Other favorite seasonings like garlic powder, onion salt, or seasoning salt — go light on the seasonings until you're sure you like the flavors with the blooms.